WINNERS! Macclesfield & Wilmslow Business Awards 2011, Independent Retailer of the Year – Bollington Brewing Co. Limited! Since reopening in March 2005 the Vale has gone from strength to strength to establish itself as a real ale and fresh food pub. After winning CAMRA Pub of the Summer in 2006, in only its 3rd year, the Vale then won East Cheshire Pub of the Year 2007. 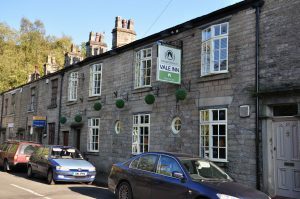 You’ll have to pop down to the newly refurbished Vale Inn to find out just how good it is. Gone is the worn and sticky carpet, the Vale Inn sports a new, clean and fresh look but don’t worry it’s still as cosy and welcoming as always. There’s a new head chef too who promises even greater things will come out of the kitchen. Table service, no more ordering at the bar! Close to the Recreation Ground, Middlewood Way and the Macclesfield Canal, there are two beer gardens and a car park. Inside there is an open friendly feeling, a touch of the old pub remains with the original slate bar from the 80’s and a taste of the new with a redesigned back bar. A real fire completes the comfort in winter. The Vale Inn web site keeps a list of ales currently being served and an up to date menu can be printed off. The Vale holds a number of Beer FestiVales each year with up to c.30 different brews to sample. Watch for notices of these. WiFi internet access is available to customers. Bollington Best won the Bronze Medal in Best Bitter contest at CAMRA’s 2011 Great British Beer Festival. It was the third year on the run their beer caught the attention of a judging panel and the competition just keeps coming from further afield. Bollington Best won Champion Beer of Cheshire in September 2009 and Silver in the ‘Best Bitter’ category at the SIBA North West region in 2010, but this time it was a group of expert beer judges, brewers, broadcasters and writers who picked the beer out from its national competitors. Their own brews! As one of only three Free Houses left in Bollington it is not surprising to find six hand pumps serving a wide selection of real ales from far and wide, including their own brewed ales (see below) and regular guests from Storm Brewing, Weetwood, Acorn Brewery’s Barnsley Bitter, Manchester Bitter from Marble Brewery, and many more. Lagers include Amstel and Heineken as well as the LocAle Moravka and Moravka Cold from Taddington Brewery. Cider is Weston’s Stowford Press. A wide selection of wines and spirits completes the offering. Since 25th July 2008 they have served their own brewed beer – the first to be brewed in Bollington for more than 80 years! The first brew was called just that, First Brew, and what a brew it was! It is now called Bollington Best and at 4.2% it is a superb session beer, medium in colour, slightly hoppy giving a perfect balance between bitterness and flavour. The beer one likes is a very personal thing but for me this is the perfect pint! It seems I’m not alone, Bollington Best won Champion Cheshire Beer 2009 , White Nancy won Silver at SIBA in Sheffield in 2010, and then the Bronze Medal with Bollington Best at the national CAMRA contest!! (see above). Their second offering was called Bollington Nights, at 3.9%, a porter that has rapidly established itself as a very popular ale. Traditional dark ale with a light smooth flavour and aroma. And the Vale Inn serves as the brewery tap! Bollington Nights won the 2009 Bronze Medal at the Sheffield CAMRA competition. Over the months Lee and Kym have brewed up a wide range of glorious beers including Dinner Ale, Ginger Brew, Happy Valley, Oat Mill Stout (5%) (Reserve Champion Cheshire Beer 2009 ), Ruby Nights, Wheat Nancy, Long Hop, Gritstone, Winter Reserve and so many others, so which ones are on the bar when you visit is hard to predict! A regular though is White Nancy (4.1%) a very pale bitter with a good hoppiness and a light body – simply delicious! This was the 2009 Silver Medal winner at the CAMRA Sheffield competition . Bottled and boxed ales are available and can be ordered click and collect. Bottled beers from this brewer are available by mailorder from Barley & Hops, Macclesfield . Food: All food is cooked from fresh, including the hand-cut chips. The menu changes regularly with a good rotation of starters and mains, the puddings are homemade and also change regularly, a choice of Granelli’s Ice Cream is available. Find a table and your order will be taken there. Food served Monday to Thursday 12 – 2 and 6 – 10, Friday, Saturday and Sunday 12 – 9. Other facilities: SciBAr – Science in the bar – that is the name of a new kind of event held monthly in the Vale Inn. Starting at 6.30pm an eminent speaker discusses a facet of modern science for the layman. These sessions have proved to be very popular, with children as well as adults! You don’t have to be a scientist, you may not understand everything that is talked about, but if you have an open mind and an interest in the discoveries of modern scientists you will certainly find it interesting, stimulating and thought provoking.Check out the SciBAr web site for details of the future events. The season starts on the second Monday of September. We meet most second Mondays of the month at 6.30pm, but not in December or August. Please order food before 6.00 if you wish to eat, otherwise service restarts at 8.00pm. Finding it: Along the main route through Bollington, look for the Dog & Partridge, turn down Adlington Road. The Vale is on the right after about 200m. Car parking is in the pub car park beyond the last house on the right or at Adlington Road car park just before the pub on the left.